5610 10I 50 Kop. 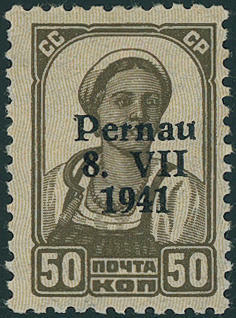 Brown, with overprint \"PERNAU 8. VII. 1941\" in of the rare type I, fresh colors and in perfect condition mint never hinged a rarity of the German occupation issues with an edition from only 800 pieces. Photo expertize \"genuine and immaculate\" Löbbering BPP. 5761 ✉ Vb 30 Kop. 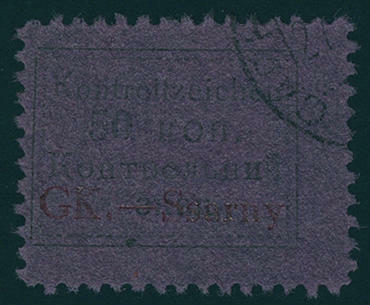 Dark violet ultramarine with overprint in dark rose red, the scarce not issued value, fresh colors, at the bottom on the right round corner, otherwise in perfect condition as enormously scarce commercially use reverse on cover with violet two ring cancel \"PSKOW 9.8.41. \", cover vertical folded, reverse a little blotched and tear in the cover at the bottom. 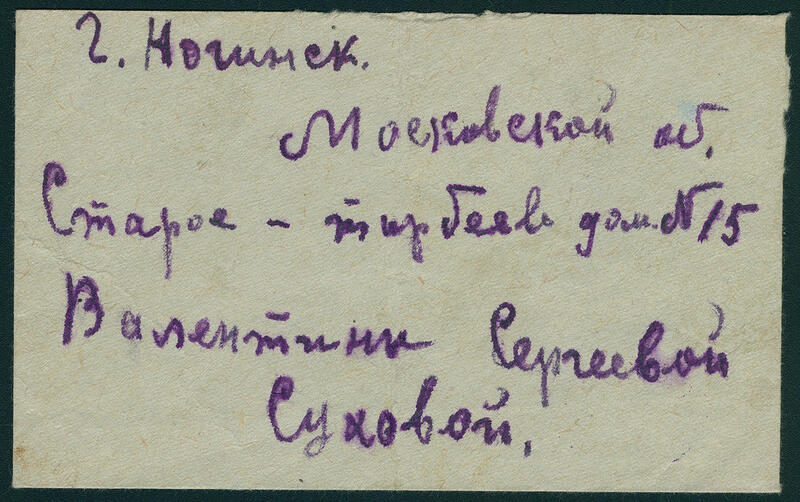 Commercially used letters of this issue to class among the all large rarities of the German occupation issues. There are very few documents have become known! Expertized wild boar BPP. 5762 VI 60 Kop. On 3 Pfg. Hindenburg, the extremely rare not issued stamp, fresh colors and very well perforated, in perfect condition mint never hinged these stamp was to the issue prepares, was however due to of an intervening baned no longer issued. There are only few examples have been preserved, which especially in of this outstanding quality, to the rarities of this area count. Photo expertize \"the condition is perfect\" Krischke. 5763 4P 60 Kop. 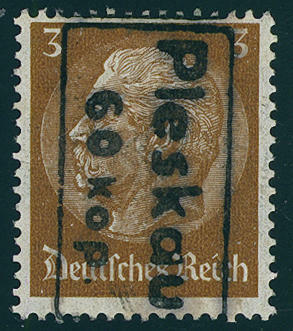 Carmine with scarce vertical sample overprint \"PLESKAU\" without designation of value, fresh colors and in perfect condition mint never hinged from upper margin. With an edition from only 65 pieces belongs this proof to the rarities of the German occupation issues! Photo expertize Zirath BPP. 5764 ⊙ 16BI 60 Kop. City kindergarten 1942 cut in the complete miniature sheet to 10 values, wonderful fresh colors, unfolded and neat cancelled \"PSKOW 6.3.42. \". As well under field 7 parts of the factory watermark \"LIGAT\", as well on field 10 the plate flaw \"X in lieu of K\". With a total issue from only 3000 pieces are only still very few miniature sheet in used condition in this quality have been preserved! 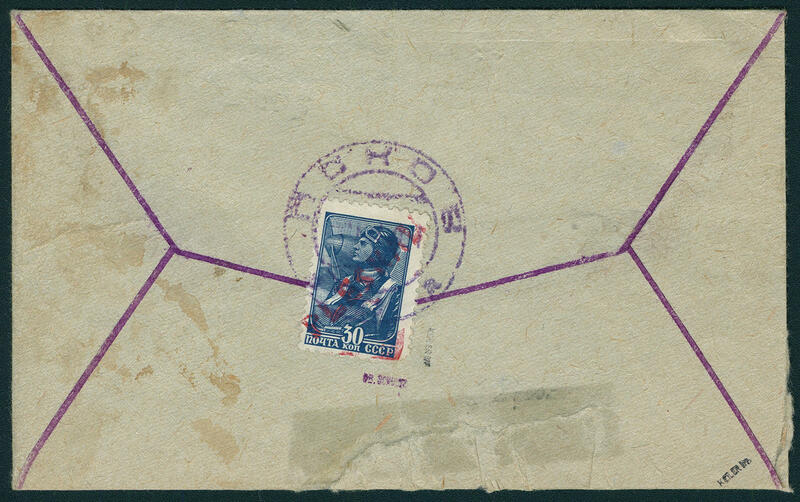 5777 ✉ 4AGI,5AayII 50 K. With extremely scarce printing on the photostatic back side (type II), as well 1, 50 Krb. Black on medium ochre-brown, vertical striped thick paper (type II) with additional franking from further four values on very nice, not transported cover clean and on self-formed pages \"SARNY 27.11.41. \". A Top-rarity of this area in perfect condition. Photo expertize Zirath BPP. Michel for single stamps 6850,- €. 5778 ⊙ 4AGII 50 Kop. Black on dark gray blue, the very scarce variety \"printing on the Paper back\", fresh colors and neat cancelled in perfect condition. The edition of this variety amounted to be on only 25 values, so that only eight examples in type II ever possible are. A major rarity of this area! Photo certificates \"the condition is perfect\" Zirath BPP, Krischke BPP. 5767 ⊙ Bl.1/2 Semendria souvenir sheet pair 1941, both souvenir sheets fresh colors and in original size with special cancel \"SEMENDRIA\" in perfect condition. Genuine used, particularly since in of this outstanding quality, an extraordinarily scarce issue! Photo certificates Brunel. 5768 ✉ 68 10 on 12 Din. 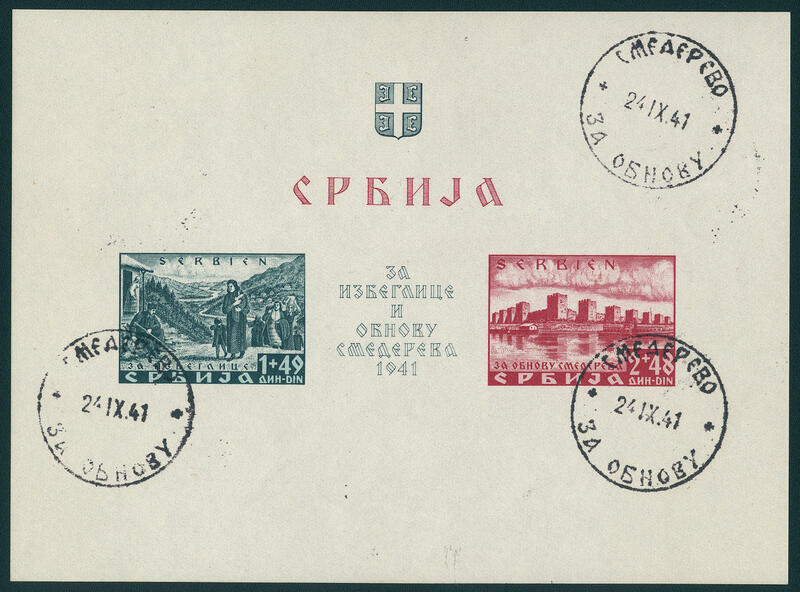 Airmail 1942, in perfect condition as very nice correctly franked single franking on attractive, commercially used registered business letter from \"VRSAC 3. IX. 42. 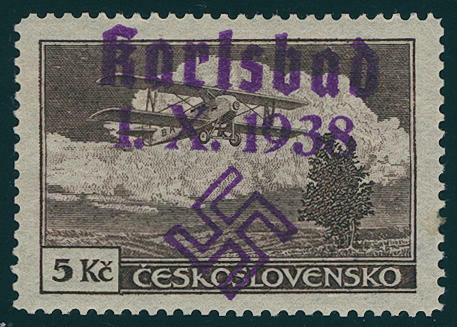 \" with censorship strip and censorship stamp from Command of the Armed Forces to Schwarzenbach with arrival postmark. Very rare! 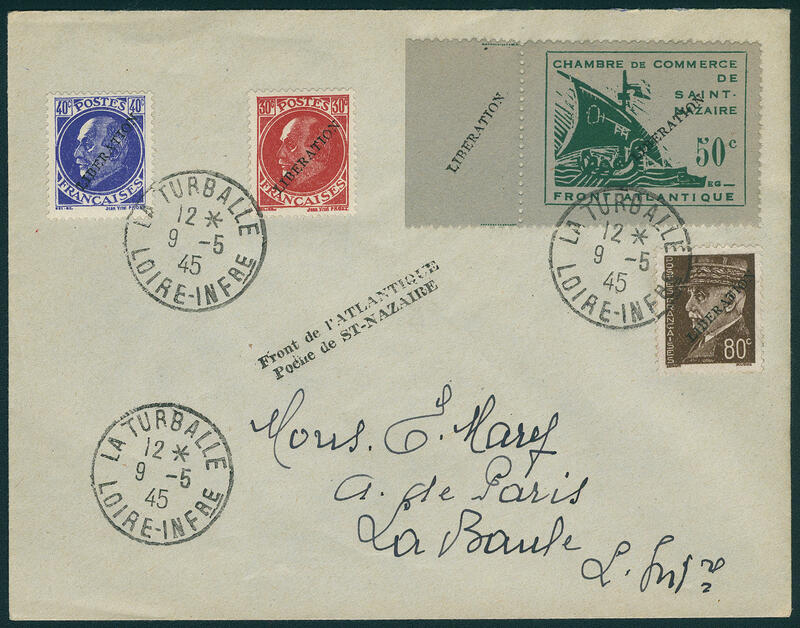 5721 ✉ 1 50 C. Chamber of commerce 1945 with overprint \"LIBERATION\" from left margin of sheet (also this with overprint) with additional franking of three values France with overprint \"LIBERATION\" on cover from \"LA TURBALLE 9.5.45. \" to La Baule addressed. 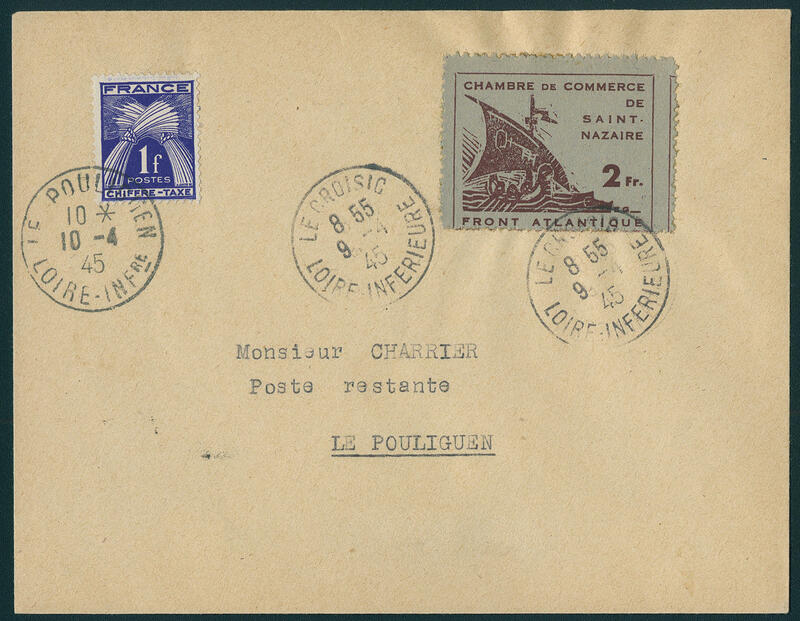 5722 ✉ 12a Chamber of commerce 1945, both values with additional franking France on decorative registered cover with provisional registered stamp from \"LE POULIGUEN 9.4.45. 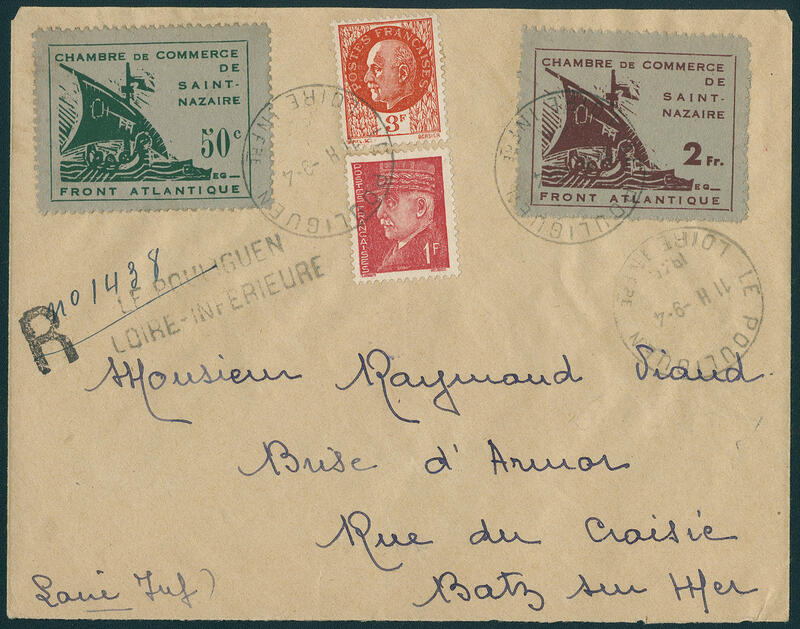 \" to Batz Sur Mer with arrival postmark. Very decorative and rare! 5723 ✉ 2a 2 Fr. Lilac brown on green, in perfect condition on cover from \"LE CROISIG 9.4.45. \" to Le Pouliguen, there with postage due stamp postage stamps added. A decorative, philatelic document! 5561 20 50 H airmail with hand stamp overprint \"Karlovy Vary 1. X. 1938. \" in dark bluish purple, fresh colors and very well perforated, in perfect condition unused with original gumming. Issued only 105 examples and by Michel undervalued. Photo expertize \"the condition is perfect\" Brunel VP. 5562 21 1 Kc. Airmail with hand stamp overprint \"Karlovy Vary 1. X. 1938\", fresh colors, above perforation bluntish, otherwise in perfect condition unused. Issued only 105 pieces. Expertized Mahr BPP, photo expertize Brunel VP. 5563 22 2 Kc. 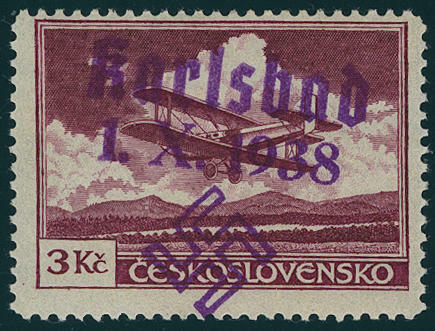 Airmail with hand stamp overprint \"Karlovy Vary 1. X. 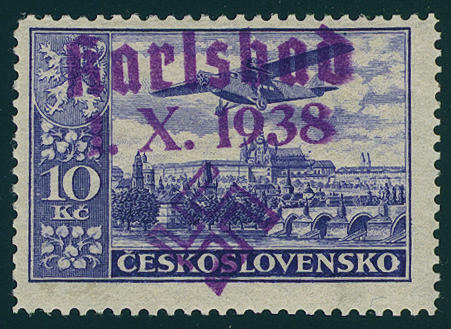 1938\" in dark bluish purple, fresh colors and in perfect condition unused. An outstanding quality this large rarity! The total print run amounted to be on only 31 examples, so that especially unused examples hardly ever offered become. By Michel catalogue clearly undervalued! Expertized Mahr BPP, photo expertize \"the condition is perfect\" Brunel VP. 5564 23 3 Kc. 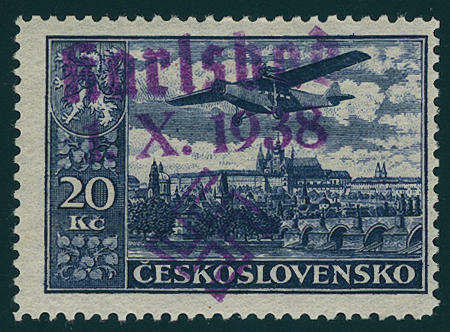 Airmail with hand stamp overprint \"Karlovy Vary 1. X. 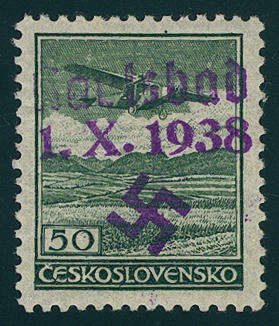 1938\" in dark bluish purple, fresh colors and very well perforated, in perfect condition unused with original gumming. An outstanding quality this large rarity! The edition amounted to be on only 25 examples, so that especially unused pieces hereof hardly ever offered become. In the Michel catalogue clearly undervalued. Expertized Mahr BPP, photo expertize \"the condition is perfect\" Brunel VP. 5565 24 4 Kc. 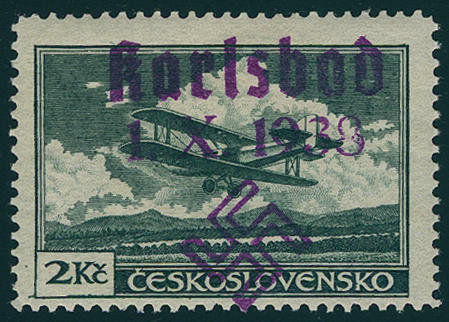 Airmail with hand stamp overprint \"Karlovy Vary 1. X. 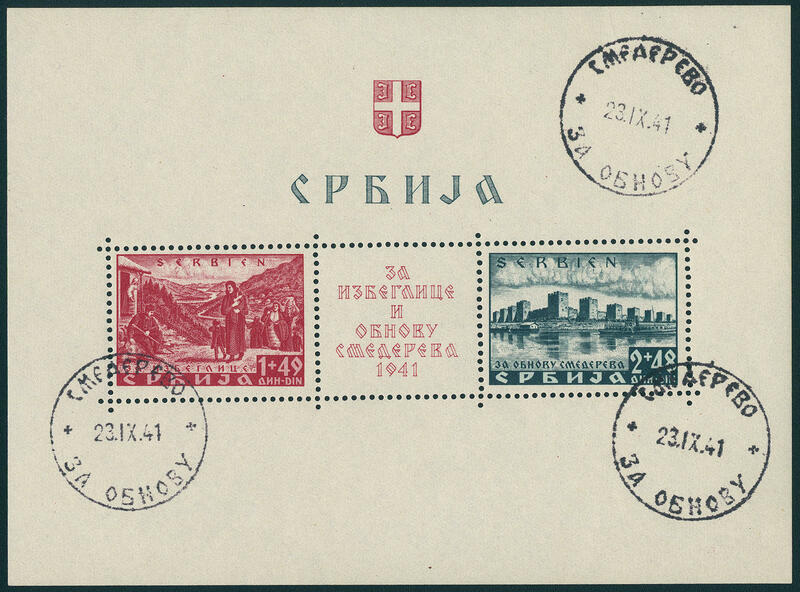 1938\", fresh colors and very well perforated, in perfect condition unused with original gumming. An outstanding quality this large airmail rarity! The edition amounted to be on only 17 examples, so that especially unused stamps hereof pretty much never to be on offer. By Michel catalogue clearly undervalued. Expertized Mahr BPP, photo expertize \"the condition is perfect\" Brunel VP. 5566 25 5 Kc. 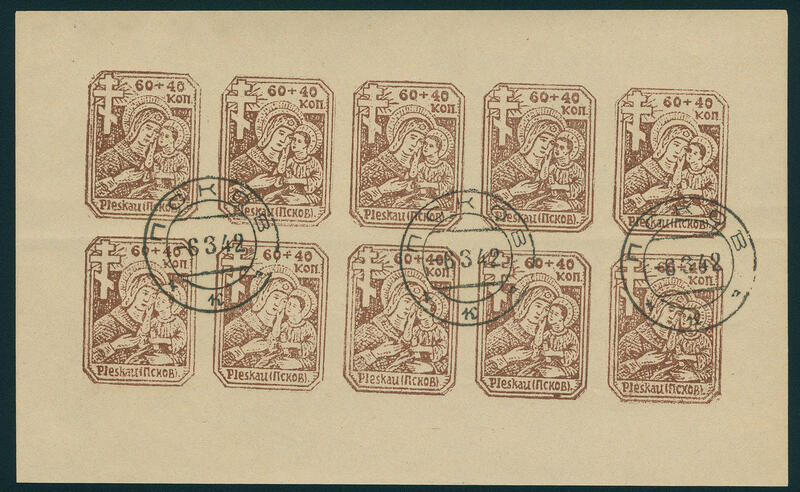 Airmail with hand stamp overprint \"Karlovy Vary 1. X. 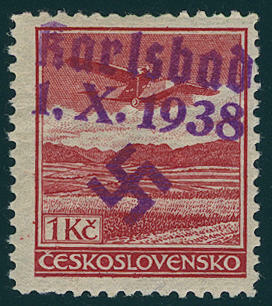 1938\" in dark bluish purple, fresh colors and very well perforated, in perfect condition unused with original gumming. An outstanding quality this large rarity! The edition amounted to be on only 25 examples, so that especially unused stamps hereof hardly ever to be on offer. By Michel catalogue clearly undervalued. Photo expertize \"the condition is perfect\" Brunel VP. 5567 26 10 Kc. 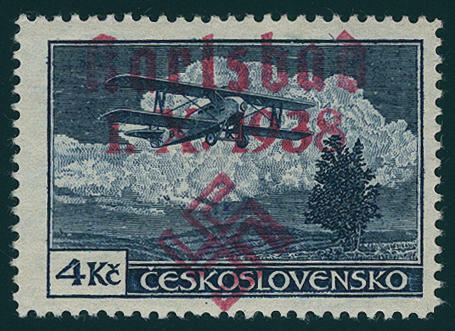 Airmail with hand stamp overprint \"Karlovy Vary 1. X. 1938\", fresh colors and very well perforated, in perfect condition unused with original gumming. The edition of this stamp amounted to be on only 20 examples, so that especially unused pieces hardly ever to be on offer. By Michel catalogue clearly undervalued! Expertized Dr. Hörr, photo expertize \"the condition is perfect\" Brunel VP. 5568 27 20 Kc. 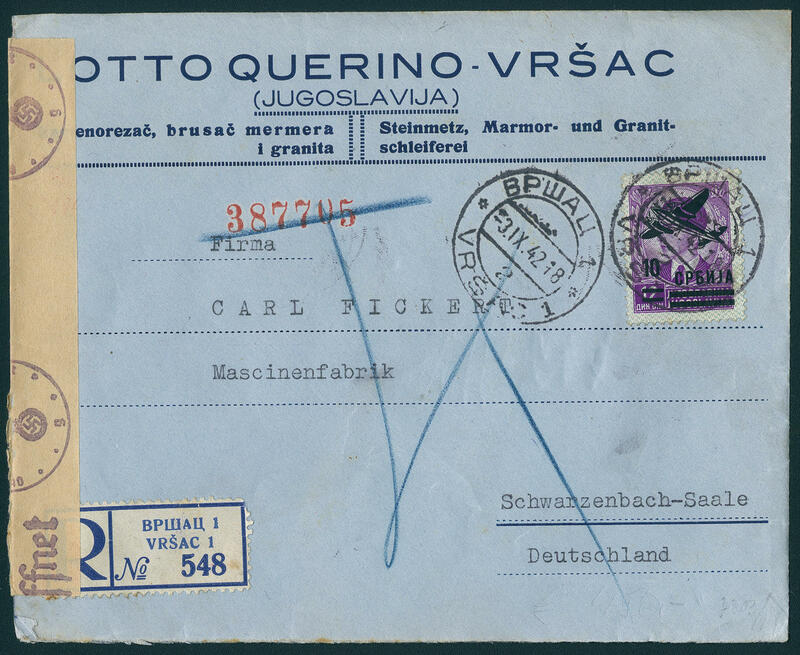 Airmail with hand stamp overprint \"Karlovy Vary 1. X. 1938\" in dark bluish purple, fresh colors and in perfect condition unused with original gumming. 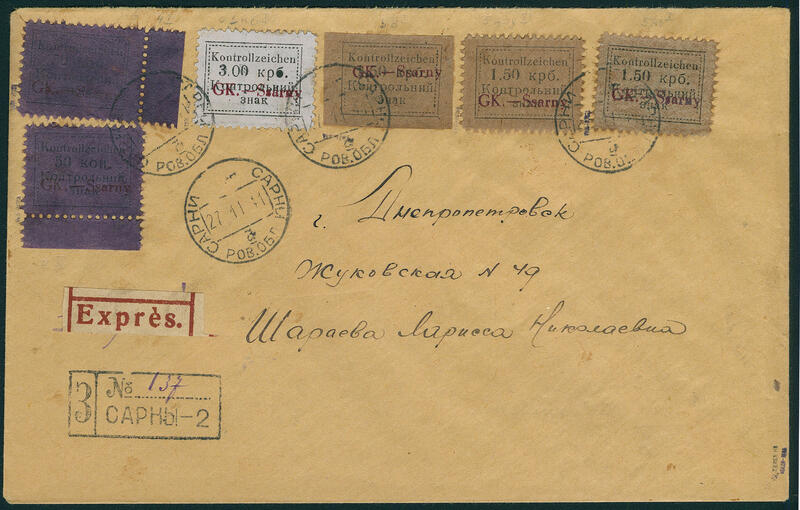 An outstanding quality this large Sudeten territory and airmail rarity. With a total issue from only 18 pieces are especially unused examples nearly unknown. By Michel clearly undervalued. Expertized Dr. Hörr, Mahr BPP, photo expertize \"the condition is perfect\" Brunel VP.